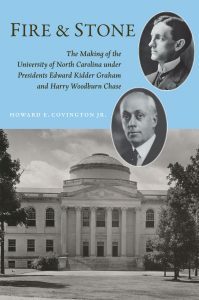 Between 1913 and 1930, the presidencies of Edward Kidder Graham and Harry Woodburn Chase transformed the University of North Carolina from a small institution in the liberal arts tradition to a modern research university serving the state. In “Fire and Stone: The Making of the University of North Carolina under Presidents Edward Kidder Graham and Harry Woodburn Chase,” author Howard Covington tells the story of this remarkable growth and the two men whose vision and force of will propelled the University into the future. Graham and Chase were a study in contrasts. Graham was a southerner and a superb public speaker. Chase was a scholarly New Englander with a shy demeanor and a preference for the written word. Yet when Graham died during the 1918 influenza pandemic, it was a young Chase who realized Graham’s ambitions to extend the work of the University for the benefit of all North Carolinians. Their quest continues to hold relevance today as the questions of their time—athletics, campus growth, and especially the independence of the University, for which Chase was a passionate advocate—remain very much in the news. “Fire and Stone” is supported by the Albert and Gladys Coates Endowment Fund for the North Carolina Collection at the Wilson Special Collections Library. In partnership with UNC Press, the Library will publish biographies of all past presidents and chancellors of UNC-Chapel Hill, distributing them in both print and as online open access texts. The series began with Covington’s “The Good Government Man,” a biography of Albert Coates, who founded Carolina’s Institute of Government. Author Howard Covington will speak at Wilson Library on February 19 in the launch event for “Fire and Stone.” The program is free and open to the public. It will begin at 5:30 p.m., following a 4:30 p.m. reception.